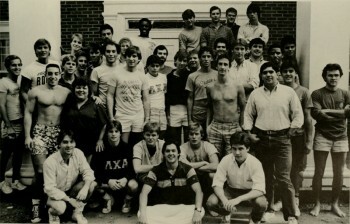 Gamma-Psi Chapter of Lambda Chi Alpha at Lehigh - Why Do You Give to Gamma Psi? Why Do You Give to Gamma Psi? "Throughout my adult life my wallet has been tugged on by many different forces and charities. Then there is the ever-present "save for retirement" refrain. When the stars have aligned, however, I have been glad to be able to give to Gamma Psi. Why? I have said on many occasions that LXA, through its big brother program is what got me through Lehigh. I had a less-than-stellar Freshman year and when I pledged LXA, Brother Breckley took control of my life and tried hard to get me to study and do better scholastically. Left to my own devices, in a dorm, I'm sure I would have not made it through my Sophomore year. As it was, it was a struggle to make it through, but I (and LXA) triumphed. I believe in the fraternity system." "I give because of the gift of memories and lessons I learned from my days at Lambda Chi." "The Lambda Chi's I met at college were absolutely the best men I've ever met in my life. My Lambda Chi Alpha experience influenced me in a positive way then and it still influences me today, over 60 years later. How fortunate I was... and am." "I developed life-long relationships through my association with Lambda Chi Alpha, and many of my experiences within the fraternity helped to prepare me for life's challenges. That is why I support the annual fund."